Destinations include the places, landscapes and communities where sport tourism development takes place. Whether sport tourism development takes the form of sport events, active participation in sport, and/or sports nostalgia/heritage, it draws on local resources, forms part of the complex dynamic of daily life. As such, sports tourism has implications for residents, with destination communities in a position to benefit from, or absorb the costs of, the extent to which development is sustainable. Subsequently, this book features contributions that focus on sport tourism and destination sustainability. Issues covered include, though are not limited to, destination management, surf localism, the production of space, event sustainability in national parks, utilisation of sport heritage for destination promotion, enhancing the attractiveness of destinations through sport tourism, destination development and sport tourism, utilising sport to motivate travel to destinations and environmentally responsible behaviour in sports tourism destinations. 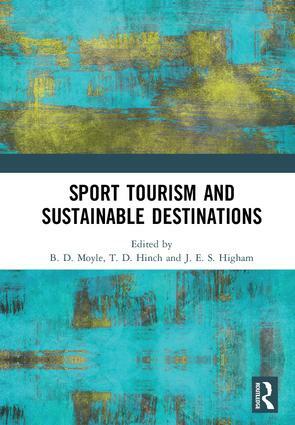 The unique contribution of this edited volume is the multi-disciplinary approach applied to enhance conceptual understanding of issues surrounding sport tourism and destination sustainability. The chapters originally published as a special issue in the Journal of Sport & Tourism. Brent Moyle is a Mid-Career Advance Queensland Fellow and Senior Research Fellow at the Griffith Institute for Tourism, Griffith University, Australia. Dr Moyle’s research focuses on three interrelated research streams, sustainable tourism, experience design and evaluation and sports tourism. He is an Adjunct Professor at Southern Cross University (Australia). Tom Hinch applies a multidisciplinary approach to the understanding of sport tourism, leisure and conceptually related fields. Porfessor Hinch has a core research focus centred on advancing knowledge surrounding the way sport travellers understand the places they visit. He is a visiting Professor, Faculty of Tourism, Wakayama University (Japan). James Higham is a Professor specializing in tourism, environmental change, with long standing contributions to the field of sports tourism. He is the Co-Editor of the Journal of Sustainable Tourism and holds the positions of Visiting Professor of Sustainable Tourism at the University of Stavanger (Norway), and Jim Whyte Fellow, University of Queensland (Australia).